ALBANY – Barbara “Bobbie” Nerf Ebel, 87, of Albany, passed away peacefully on Thursday, February 16, 2017 in the Hospice Inn at St. Peter’s Hospital after a brief illness. Born in Albany, she was a graduate of The Cathedral Academy of Albany and worked for New York State Retirement System. Barbara was predeceased by her loving husband of 58 years Charles Ebel. She is survived by her children Susanne Printy (Edward) of Cohoes, Jacqueline Kuehnert (James Chadwell) of Rome, Maureen Languish (William) of Selkirk, Charles Ebel (Laura) of Colonie; her sister Maryrose Frankovic of Delmar; as well as 9 grandchildren, 12 great-grandchildren and several nieces and nephews. She was also predeceased by her parents Bernard and Josephine Nerf; her sister Marjorie Michela; her brother Richard Nerf; and her infant daughter Katherine. 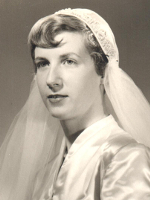 A Mass of Christian Burial will be celebrated for Barbara on Thursday, February 23rd, at 11:00 a.m. in the Church of St. Clare, 1947 Central Ave, in Colonie. Relatives and friends are invited. Interment will be in the Gerald B. H. Solomon Saratoga National Cemetery after the mass at 1:30 p.m., where she will join her love that she missed deeply. Those who wish to make a contribution in lieu of flowers may donate to Mohawk Hudson Humane Society, 3 Oakland Ave., Menands, NY 12204. To leave a message of condolence for the family, please visit www.HansFuneralHome.com. My deepest sympathy to your family for the loss of your loved one. May you find comfort in God’s promise of a resurrection found at Acts 24:15.